These pies are easy to make for the Holiday season. 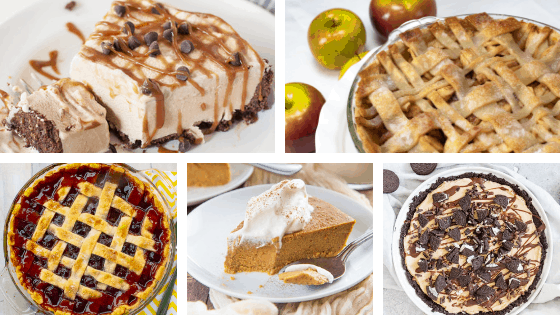 The list contains old-fashioned, vegan, gluten-free, and dairy-free pies. Whether you’re sitting down for a Thanksgiving or Christmas meal, dessert always follows. After your family fills their bellies with a delicious meal they soon after ask what’s for dessert. Every year at our family gatherings I’m in charge of the desserts and I always bring pie. It’s a tradition in our home and most likely a tradition in yours. The list below contains classic apple pie recipes as well as other fruits such as cherry and cranberry. For the more decadent lovers, there are options for peanut butter and chocolate. And of course, the traditional nut flavors of pecans and walnuts.